Posted under Health Guides. Updated 29 October 2018. A soy allergy is an allergy to soybeans and is a common food allergy affecting 0.4% of children. Soy allergies are often detected during early infancy as many infant formulas are soy based. 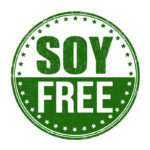 Research studies have found that most children with a soy allergy will outgrow the allergy by the age of 10. A soy allergy develops when the immune system identifies certain soy proteins as harmful, causing an allergic reaction. How do I know if a food has soy in it? If I have an allergy to soy, are there any other foods I need to be careful about? Under FDA (Food and Drug Administration) guidelines, highly refined soybean oil does not need to be labeled as an allergen. Research has shown that most people can safely eat soy oil if it has been highly refined because the protein has been removed. Soy lecithin does contain a small amount of soy protein and must be labeled on the product. However, the amount of protein is so low that the majority of people allergic to soy will not have a reaction to soy lecithin. If you have an allergy to soy, please talk to your health care provider to find out whether or not you should avoid soy oil and/or soy lecithin. Asian cuisines are identified as high-risk for people with a soy allergy. Soy is a commonly used ingredient in Asian dishes and there is a high risk of cross-contamination even if the item listed on the menu does not appear to contain soy. Are there any non-food products that might contain soy? Yes! It might sound surprising but soybean products are being used in many non-food products and even used to power city buses, insulate buildings, and even used in the filling of some stuffed animals. Many companies are marketing their products as “green” and “eco-friendly” which often means that a soy-based alternative to petroleum products is being used. The research is still unclear on soy food allergies and non-food soy products so it is always import to check the ingredients of cosmetics, shampoos, or anything else you might be putting on your skin. And of course, if you have soy allergies don’t put these products in your mouth.